The first phase of an ambitious computing network designed to handle huge amounts of data has been launched. The network, dubbed the Grid, has been set up by the Cern labs in Geneva to tap into the processing power of computers in 12 countries. The aim of the project is to handle data from an experiment on how the Universe began. Cern believes the Grid could eventually provide people access to a vast pool of processing power from their desktops. The idea behind Grid technology is to link up computers around the world over the internet to create a new generation of enormously powerful machines. The networks are needed because some problems in science are just too large for any one machine to tackle by itself. 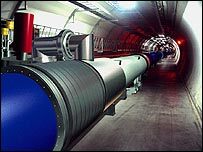 Cern's Grid will initially be used to handle the terabytes of data generated by an upcoming particle accelerator called the Large Hadron Collider (LHC). The LHC is going to test the Big Bang theory by smashing protons together at high energies. The data generate by the experiment are expected to fill the equivalent of more than 20 million CDs a year and some 70,000 computers would be needed to analyse the data. With the LHC Computing Grid project, scientists will be able to access computing resources across the world as though they were on their machine. "The Grid enables us to harness the power of scientific computing centres wherever they may be to provide the most powerful computing resource the world has to offer," said Les Robertson, project manager at Cern. The first phase covers processing resources from research institutes in 12 countries - the UK, the US, Switzerland, the Czech Republic, France, Germany, Hungary, Italy, Japan, Russia, Spain, and Taiwan. The final goal of the Grid is to bring together the computing power of scientific centres across the world to create a virtual supercomputer network. In the long-term, Grid technology is predicted to revolutionise the world of computing. Ultimately it is expected to be able to provide huge processing power on tap to anyone. "The technology now being deployed for particle physics will ultimately change the way that science and business are undertaken in the years to come," said Ian Halliday, Chief Executive of the UK's Particle Physics and Astronomy Research Council, (PParc). "This will have a profound effect on the way society uses information technology, much as the worldwide web did."